Mokkō, with small side lobes; on each face a wide slightly raised border, joined to the sd. 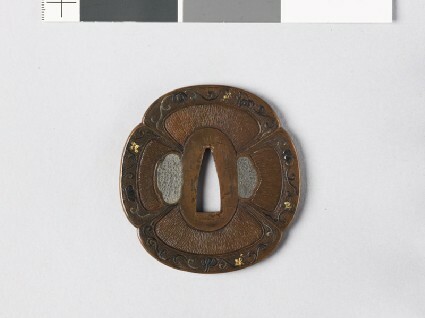 by four cusps, has a simple scrolling stem with leaves and grapes, partly relieved in the copper, partly in silver, shakudō and gold; this is on a primitive nanako ground, the enclosed spaces of the guard having a pattern of radiating broken lines resembling leather grain; chrysanthemum-punched plugs to rh. Coarse work; a few experimental patches of nanako on the front of the sd.